In 1903 Ohio State Fair Began the Butter Cow Tradition. . . .
2014 Butter Cow was named Scarlet and her calf Gracie to honor OSU. In the early 1900s, The Ohio State University and the Dairy Processors of Ohio sponsored butter sculpting contests at the Ohio State Fair. The subjects of these contests were not restricted to specific things. 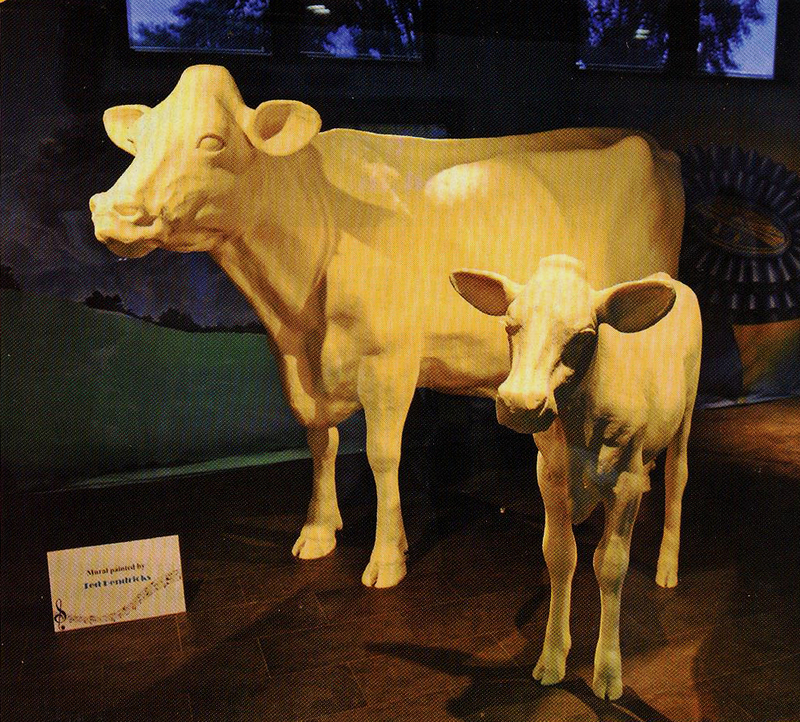 In 1903, the first butter cow was featured at the Ohio State Fair, sculpted by A. T. Shelton & Company, distributors of Sunbury Co-Operative Creamery butter. She became the first of a yearly treat for visitors to the fair. In the 1920's a calf joined the cow and the two have appeared every year since. There us an online contest to name them each year. It take 2000 pounds of butter to make the cow, calf and other sculptures which accompany them each year. Paul Brooke, one of the current team of butter sculptors recently told Ohio Magazine "Butter is a easy medium to work with but some people do not like it because its greasiness. Plus, you have to be in a cooler to do it. Book is from Cincinnati and a former toy model sculptor for Kenner Products an Hasbro toy companies which made Star Wars and G.I. Joe figures in the 70's and 80's. Others on the butter sculpturing team are Alex Balz, Tammy Buerk and Erin Swearingen. Butter us slathered over frameworks of mesh, chicken wire or wood but in the cow’s case it is a steel frame with an adjustable neck so the cow’s head can move to a different position each year. Today large portion of the butter is donated by American Dairy Farmers Mideast. They use butter which has use by date has expired. See more in Columbus Dispatch, July 20, 2012 and Ohio Magazine, July 2015. Sunbury Creamery became Nestles Beverage Company which invented the first instant food Nescafe in Sunbury, Later they added Nestea to their firsts.